The positive views of the effectiveness of the Black Lives Matter movement extend to all six of the issue areas we polled. The movement is seen as most effective at protecting voting rights (68%), improving race relations (67%), and challenging police brutality (63%). More than 50 percent of the survey’s respondents also saw BLM as effective advocates for gender equality (61%), economic opportunities (59%), and LGBTQ rights (56%) in the African American community. 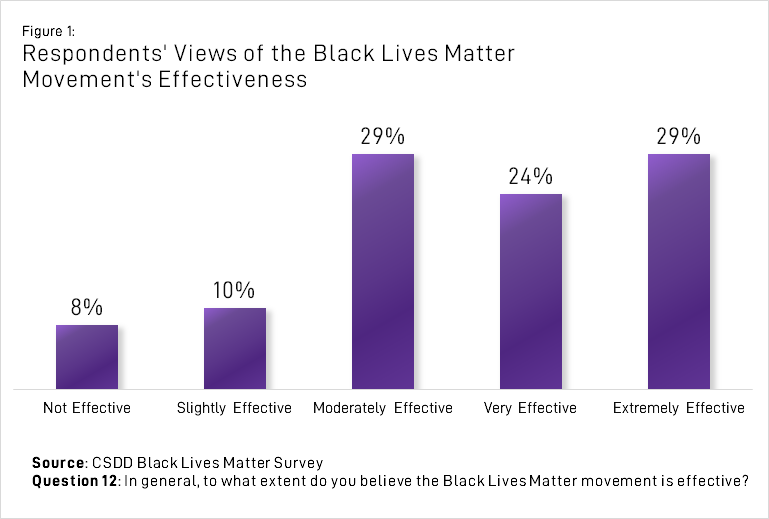 While the respondents to the survey see the Black Lives Matter movement as effective in general and across multiple issue areas, there are two trends in the data that suggest that they also see room for improvement. First, a large majority believes that the movement should focus its efforts on two issue areas—challenging police brutality and racial profiling (49%) and improving race relations (25%)—over all other issues. Second, a large majority of the respondents (64%) to the CSDD survey believes that the Black Lives Matter movement would be more effective with a centralized leadership structure under one national leader. Both of these preferences cut against the current operating strategies of the various BLM chapters that run grassroots operations around the country. The respondents to the CSDD survey also had some very clear ideas about whom they want to lead a national Black Lives Matter movement. Question 17 of the survey presented a list of the eight activists most likely to appear in media commentary about the Black Lives Matter movement between August 1, 2013 and August 1, 2017. As Figure 2 illustrates, with 27 percent of the respondents selecting him, Colin Kaepernick, the former San Francisco 49ers quarterback, is the preferred choice by a wide margin. 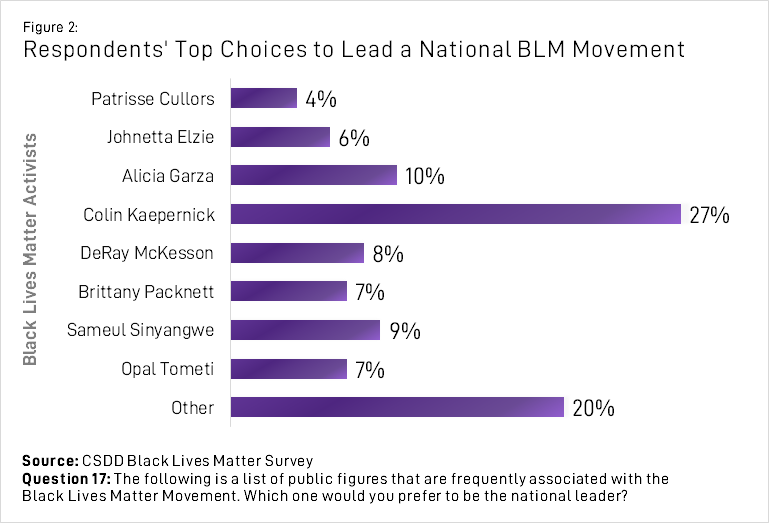 Alicia Garza, who created #BlackLivesMatter with Patrisse Cullors and Opal Tometi in July 2013, was the second choice among the respondents with 10 percent. Kaepernick’s popularity is not surprising in light of the fact that President Donald J. Trump’s criticism of the “Take A Knee” protests that he started in the NFL has thrown him into the national spotlight in recent weeks. Moreover, many of the other activists featured on the list have explicitly rejected the notion that they aim to play a national leadership role. Perhaps this is why 20 percent of the respondents believe that someone other than the activists that frequently appear in media accounts should lead the Black Lives Matter movement. The CSDD poll also points to other realities that could pose long-term dilemmas for the Black Lives Matter movement. The first is that the movement seems to have low visibility at the local level. While a large majority of the respondents (69%) said that they were aware of BLM activities in their home state, most reported also reported that the movement was largely inactive in their own backyards. 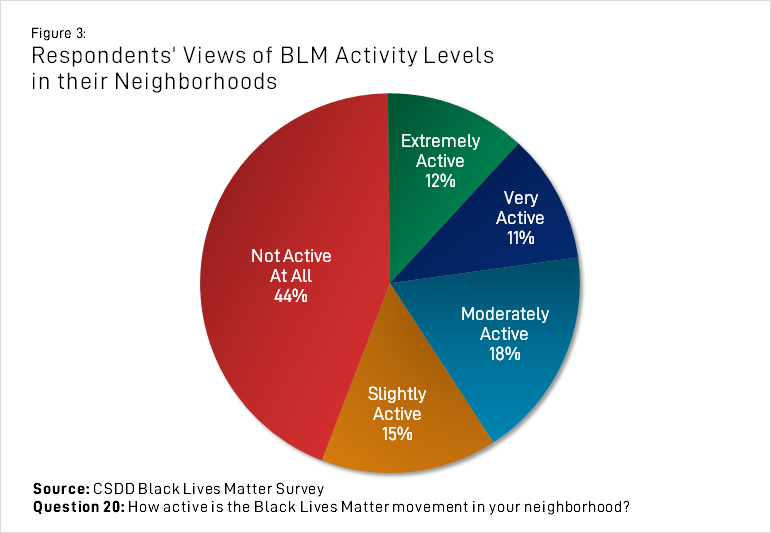 Indeed, as Figure 3 illustrates, forty-four percent of the respondents said that the movement was “Not active at all” in their neighborhoods and another fifteen percent said that BLM was “slightly active” where they live. The other long-term challenge that that CSDD poll points to for the Black Lives Matter movement is that respondents report low participation rates on three activities—protests, organizing, and fundraising—that have traditionally been important indicators of success for social movements. Fifty-nine percent of respondents have never participated in a BLM protest and an additional 13 percent have done so only rarely. The number of respondents who report never participating in an organizational meeting for BLM is 61 percent and an additional 14 percent of respondents have rarely done so. Finally, the never participated and rarely participated numbers for BLM fundraising activities are 55 percent and 12 percent respectively. Social media action is the only movement activity where a majority of respondents to the CSDD survey (64%) have positive participation numbers. Why No Margin of Error Calculations? Qualtrics Panels conducted the Center for the Study of Diversity and Democracy’s Black Lives Matter Survey using a nonprobability sample of 815 African Americans between September 22, 2017 and October 3, 2017. With this method of polling it is impossible to calculate an accurate margin of error because there is no way to determine the probability of participation for each person in the survey population. In other words, the probability of inclusion in any given on-line survey is either unknown or zero (for non-internet users). Despite this limitation, on-line polling is growing in both academic and market research. Moreover, there is compelling evidence that on-line polling conducted in a careful and systematic way—particularly through the use of demographic weights in the recruitment process—can yield samples and results that rival probability samples. This is precisely the approach taken by the CSDD Black Lives Matter Survey. As the demographics of the sample presented below illustrate, the respondents to the survey look very similar to the national African American population across most measures. Gender Distribution—The gender distribution of the sample was 50.43 percent male, 49.33 percent female, and .25 percent non-binary. Age Distribution—47 percent of respondents were between 18 and 34; 44 percent were between 35 and 54; 9 percent between 55 and 64; 5 percent were older than 65. Residential Distribution--The respondents lived in 39 of the 50 states and the District of Columbia. Forty-nine percent of respondents described their neighborhood as urban; 39 percent described their neighborhood as suburban; 12 percent lived in rural areas. Income Distribution—50 percent of the respondents earned between 30K and 75K per annum; 18 percent earned less than 20K per annum; 12 percent earned more than 100K. Educational Attainment—25 percent of the respondents were high school dropouts; 32 percent were high school graduates; 26 percent held 4-year college degrees. Voter Turnout in 2016—68 percent of the respondents voted in the 2016 presidential election.